Is it possible to have a favorite census? 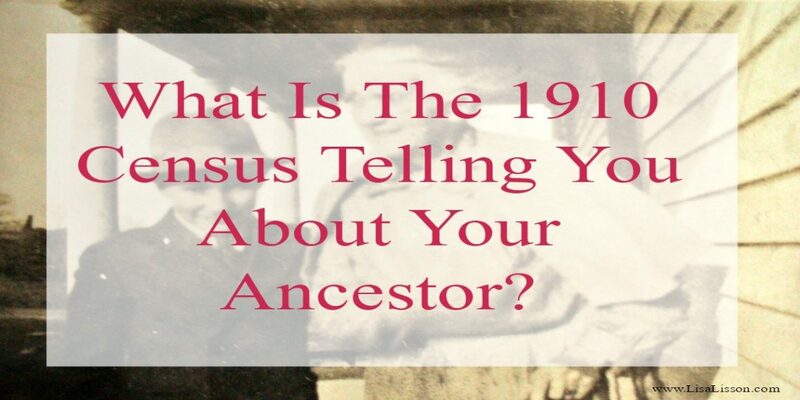 If so, I am claiming the 1910 census as my favorite! There is just something about that particular record that really opens up the stories of my ancestors to me. 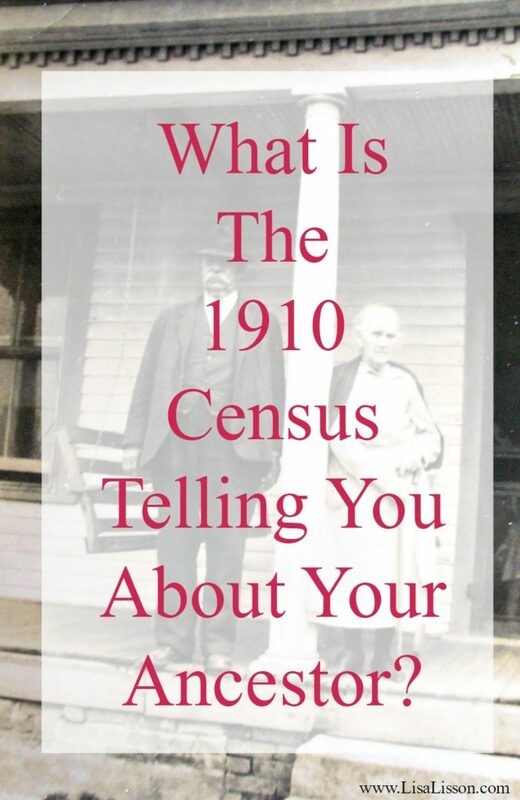 Today we are going to take a closer look at the 1910 census record and I’ll share with you some of my favorite bits. Look beyond the names and dates of birth. 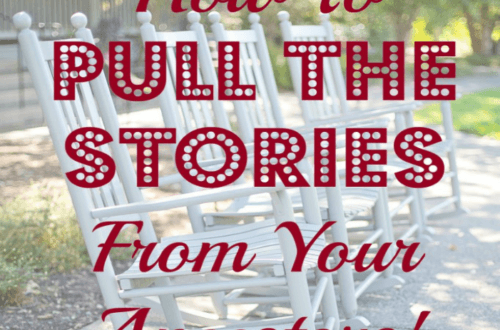 What are all of those other columns of information telling you? 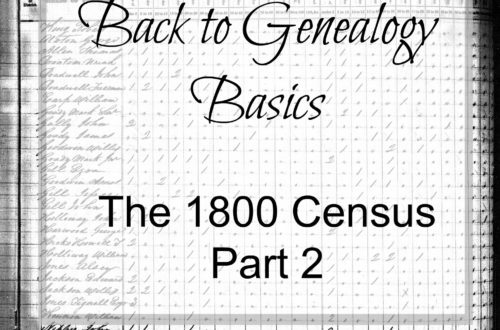 The PROCESS of analyzing the 1910 census is the same for censuses of other years. Now, let’s get into my favorite parts of the 1910 census year! 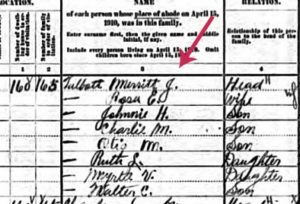 In our first example, we are looking at the 1910 census record of Halifax County, VA family Joseph Merritt Talbot [enumerated as Merritt J Talbot]. Specifically we will look at Merritt and his wife Rose. Take time to review the information at the top. 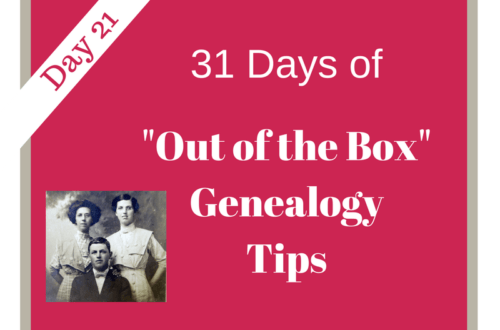 This will include the location (county and town/township) where your ancestor lived. The date tells you when the census information was collected. Here’s my favorite part – Look on the far left side. The street where the family lived is written there! Merritt and Rose can be placed on “Clarksville or River Rd” in Mecklenburg County, VA. The marriage column gives you the number of years the couple has been married. This is important! If you are struggling to determine an ancestor’s marriage date, you can get an estimate from the 1910 census marriage data. Merritt and Rose had been married for 25 years indicating they married in 1885. This is a great starting point to search for marriage record. We’ve talked about this in a previous post. Rose gave birth to nine (9) children and only seven (7) are living by 1910. This was new information to me and I can now attach 2 unknown children to her. Now turn your attention to the right hand columns. [Sometimes these can be a little hard to read.] 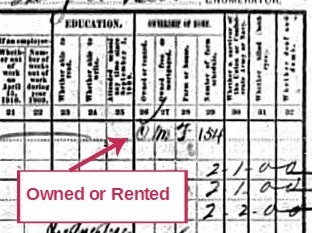 Note whether your ancestor owned [O] or rented [R] his home. If your ancestor owned his home, add a deed search to your research plan. Merrit J Talbot owned his own home. Did your ancestor work for himself [OA – Own Account] as Merritt did or was he a wage earner [W] as Merritt’s sons were. Was your ancestor a veteran of the Union or Confederate Army or Navy? 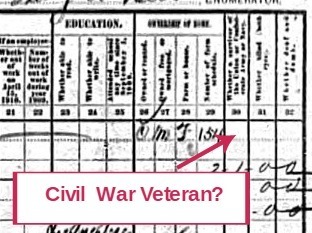 If indicated “yes” here, add Civil War military records to your future research plan. Knowing if your ancestor had a handicap or not is an interesting tidbit. In 1910, those who were deaf, dumb or blind in both eyes were noted. You will find this information in the last 2 columns on the right. So what? What does all this mean to me as a Talbot[t] family researcher? From my favorite 1910 census, I have learned a lot about Merritt J Talbot and his wife Rose. They were married ~1885 and by 1910 had lost 2 children and were raising 7 others. The family owned a farm on Clarksville/River Road in the Bluestone District of Mecklenburg County, VA as of 11 May 1910. Because he owned his farm, I have added a deed search in Mecklenburg County, VA to my research “to-do” list. I have also added their marriage record around 1885 in Mecklenburg and surrounding counties to my list, too. The Bluestone District of Mecklenburg County, VA is close to the NC/VA state line. I will move my search to bordering NC counties if a marriage record in not found in VA.
With the loss of 2 children, a search for these two is also added to the research list. Earlier census records and local cemeteries will be searched for mention of these children. Read more about finding children between census years. Merritt farmed for himself and his sons who were wage earners, likely worked for their father. Unfortunately, since the farm schedule for 1910 was destroyed, more information about his farm is not known. Merritt was not a veteran of the Civil War which makes sense as he is too young. Neither do he or Rose have a physical handicap such as deafness, mute or blindness in both eyes. Can you see why I love the 1910 census? Of course, I really love all census records, 1910 is my favorite! So glad to meet another family history nut. I thought I would share a fun tool that I like to do. You will love it. When you look on the left and see a street address put it in google maps street view. You may just be able to see the home where your great grandfather was born, etc. the other day I found an old Connecticut directory which said the mAn owned a little feet and grain store at one Main Street in town. It was still there! It brought tears to the descendants’ eyes as this was also the first in his family to come from Ireland. Can’t wait to read your next article. How wonderful, Karen! This is a great way to see where an ancestor lived and you never know just what you might find! Thanks for sharing.